#NCSEN Off the Critical Path to a Republican Majority? A lot has been written in the past two weeks about the Republican infighting in Raleigh and the negative impacts it's having on Team Tillis's campaign for the US Senate. The most current round of that fighting may be coming to an end with reports of a "framework" to end the budget stalemate between the more conservative State Senate and their more moderate counterparts in the Thom Tillis-led House and Governor McCrory's executive branch. The impact of this infighting on the US Senate race may be overblown, and one can also reasonably discount the most recent polling from Public Policy Polling data showing Kay Hagan's lead increasing. The mainstream media and the Democratic pollster both have vested interests in pushing the current incumbent. But what happens if the NC Senate seat becomes less important overall to the national Republicans and their big money allies in their quest to gain control of the US Senate? At least one leading analyst sees the North Carolina race dropping in importance to the Republicans capturing the Senate this November, and that's a sentiment that could not come at a worse time for Team Tillis. The Tillis Senate campaign has fallen way behind Kay Hagan in direct fundraising. If that kind of thinking takes hold among the big-money donors to the Tillis Campaign, the same donors who helped buy the Republican Primary, that could mean real trouble down the road. "Earlier in the cycle, we suggested that the winner of two of these three Democratic-held states would be in great shape to win the Senate: Alaska, Louisiana, and North Carolina, which we have long categorized as Toss-ups. But now that may not be the case: Democrats, in particular, could win two of these three and still narrowly lose the Senate. Of the seven states won by Mitt Romney in 2012 where Democrats are defending seats — Alaska, Arkansas, Louisiana, Montana, North Carolina, South Dakota, and West Virginia — it appears that the Democrats are doing best in Alaska and North Carolina. Sen. Mark Begich (D-AK) is running an excellent campaign, and the favored candidate of national Republicans, former state Attorney General Dan Sullivan, has been stuck in a long primary slog against Lt. Gov. Mead Treadwell (R) and 2010 GOP nominee Joe Miller (R). Sullivan is catching it from both Democrats and his fellow Republicans right now, and some Republicans are worried that he’ll be so damaged he won’t be able to catch Begich, assuming he wins the Aug. 19 primary. Both of these races remain Toss-ups, but Democrats look slightly better positioned in both at this point. Our “best two out of three” argument from earlier this cycle might be inoperative because Iowa is now so competitive. At this point, the most plausible path to a bare Republican majority of 51-49 looks like this: Beat incumbents in Arkansas, Louisiana, and Montana, and win open seats in Iowa, South Dakota, and West Virginia. Hence the Hawkeye State’s increased importance in the Senate landscape." Notice, North Carolina does not make the cut in this list. Last week there were also other events that do not bode well for the Tillis Campaign if either of these stories gain traction later in the election season. First, by the Tuesday deadline, it appear three candidates made the official write-in list for the US Senate Race. The DailyHaymaker blog has the details here. Then on Thursday the I77 HOT Lanes story once again made the news. This time raising the possibility of a lawsuit seeking an injunction against the project. CorneliusNews.net has that story here. In an extremely tight race either of these stories could sway things just enough to have an impact. If that impact comes in the form of any reduction in dark money for Team Tillis in favor of a race perceived to be more winnable such as the one in Iowa, that could prove decisive. HOT Lanes: Disagree with Davidson Mayor John Woods? You are a liar or a scaredy cat! We've recently been pretty rough on Davidson Mayor John Woods. But with all his recent squashing of debate at Davidson Town Hall and colluding with the other North Mecklenburg Mayors to push the much maligned HOT Lanes project forward, it's criticism well earned. 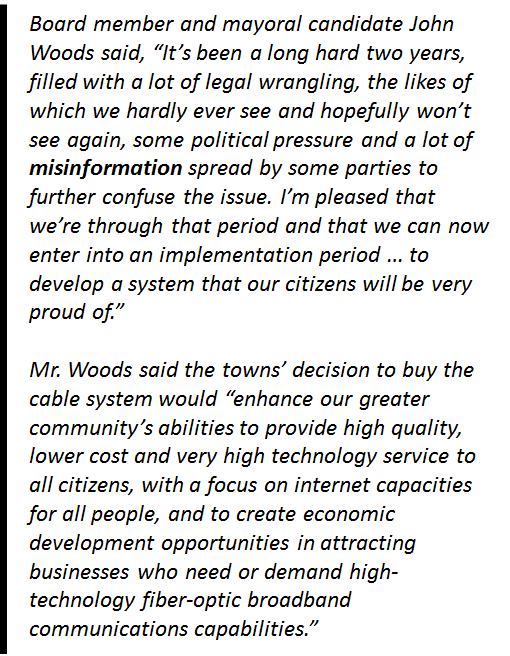 If you ever disagree with Mayor Woods, you can be sure that he'll toss out the "misinformation" accusation at the earliest opportunity. Tellingly, this accusation is never accompanied by exactly what the misinformation was or what the correct information should be. He sort of just throws it out there and lets it hang in the air to color the debate. It's nothing but a polite way to call someone a liar without using the word. Ironically, he has a long history of using this divisive tactic on major local issues where he's the one who turned out to be wrong. While John Woods may think the debate is over regarding commuter rail, the actual owners of the track, Norfolk Southern, obviously would disagree. The rail road company recently put the kibosh on track sharing in the corridor which effectively kills the project unless hundreds of millions in new funding appears, or the State gives them a sweetheart deal on their permanent use of alternative track currently owned by the North Carolina Rail Road. 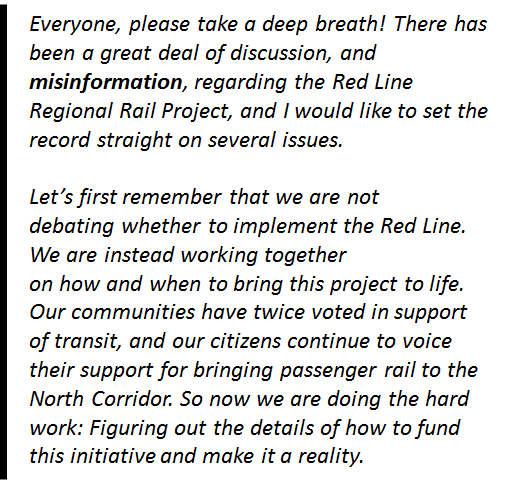 Additionally, Mayor Woods himself recently said at a Community Chat in Davidson that the current financing plan for the Red Line - the financing plan he was defending in the above quoted article - is "dead"
Were those opposing the Red Line in 2012 spreading misinformation? Or were they right? Let's go even further back in time to 2007 and we'll find, John Woods saying this to DavdisonNews.net about the oh so successful Mi-Connection deal he helped push through. For those in Davidson who have had to suffer with the fallout of the terrible decision to enter the cable business, this one should be particularly bile inducing. This decision pushed and supported by John Woods nearly bankrupted the town. It has cost the town dearly in lost opportunities as millions upon millions are poured into the operation to bail out the politicians who foisted it on the citizens. Some of the Davidson locals who opposed this disaster had experience in high finance, technology, and telecommunications. One such person, former Mi-Connection Chairman, John Venzon, opposed the decision to create the company, but he then had the courage to step in and spend years cleaning up the mess John Woods helped create. Again, were those opposed to this decision spreading misinformation, or were they right? Mayor Woods has recently become the face of the HOT Lanes project among local elected officials. He is the project's most vocal champion, and so the "misinformation" accusations start flying. This time however, he's taking the rhetoric one step further claiming other leaders have somehow become "scared" by HOT Lanes opponents - by people who are simply asking questions and demanding information about a project that will impact their lives for decades. Let's be clear. The other elected officials who are questioning the project aren't scared. They are doing their jobs to protect the citizens who elected them - a job that Mayor Woods has failed at repeatedly in the past. In light of recent developments on the I77 project as well as the likely demise of the Red Line commuter rail project (unless the State hands over permanent control of a chunk of the NCRR to Norfolk Southern), it seems like a good time to reprise a transportation alternative for the Lake Norman region first mentioned in these pages a year and a half ago. Proponents of the HOT lanes project have often falsely proclaimed that those opposed to HOT lanes are philosophically opposed to government action and have proposed no viable alternatives. In truth, opponents are just opposed to bad ideas. With Commissioners slated to meet with the NCDOT at Monday's Cornelius Town Board meeting to get answers on the HOT Lanes contract, it may be valuable to keep in mind alternate possible scenarios to meet our transportation needs. The State position on widening I-77 boils down to this. HOT Lanes via a Public Private Partnership (P3) is the only plan that works. There is no funding to do it any other way - especially with general purpose lanes. That's their story and they are sticking to it. What has not been explained clearly to the public is what exactly has been worked through before coming to this decision. Clearly, there could be other ideas that could work. Yes, there may be trade-offs, but there certainly could be an alternative plan that would relieve the worst congestion, meet improved mass transit capabilities, meet criteria that would ostensibly improve air quality, and likely qualify for the various funding pots dedicated to managed lanes - all without locking the State into a 50 year toll project. broke the project into phases to make the costs more manageable. got creative on maximizing usage of the available capacity. accessed all possible funding mechanisms. Extend the existing HOV lanes up to Exit 36. Allow limited use of the HOV lane to Hybrid an/or ILEV vehicles for a fee. Enhance the Express Bus service from Exit 36 to Charlotte. Expand 77 again with a third general purpose lane north of Exit 23 to Exit 30 by building a new HOV lane and converting the current HOV lane to general purpose. Widen any overpasses as needed at that time. Since many of the existing pools of money are restricted to "managed lanes" the expansion of the single HOV lane in Phase 1 should qualify. Converting the HOV lane in Phase 2 to a GP lane would/should not be an invalidation of the agreement around the original funding for managed lane in Phase 1 as long as the State made the Phase 2 lane HOV. There would still be the same HOV capacity. Charge a $100 per year fee for special plates to any Hybrid/ILEV vehicle that wanted unlimited access to the HOV lane. This type of fee is done in places like Virginia and Florida as examples. Yes $100/yr would be much higher than in those states, but it would certainly be less than paying a toll every day for high users of the proposed HOT lanes in the current plan. The state could manage the number of plates issued to ensure the capacity of the HOV lane is not overloaded. However, maximizing the use of this lane would free capacity on the GP lanes and make all lanes flow more freely. Reprioritize Mecklenburg 1/2 cent transit tax money for the Red Line to the HOV lane. "high-occupancy vehicle facilities" are authorized valid expenditures as part of the bill allowing the transit tax passed in 1998. This is a valid pool of money that has never even been mentioned in the HOT lane discussion. It's a sacred cow we can no longer afford. Pro: The State says there is no money for widening I-77 with general purpose lanes for decades. This plan gives the State that time while allowing for the relief of the immediate traffic congestion in the Lake Norman area. Pro: Same number of total lanes at end of Phase 2. Pro: The immediate costs would be significantly less. Pro: There would be all of the transit and carpooling enhancements of the HOT plan. Pro: No locking in the State to a 50 year contract via a P3. Pro: No tolls, but still a revenue stream from special plates users to partially fund future expansion. Con: Could just move the current bottleneck down to Charlotte. Con: Does not address Charlotte's issues around I-277. Con: There is no guarantee that Phase 2 money is available decades from now. Con: It does not guarantee a travel time under the absolute worst conditions like HOT. Con: Two construction projects over time. So the question is this. If a plan like the one outlined here is workable, do the Pros outweigh the Cons and should the cost of addressing those Cons be paid only by Lake Norman commuters via the proposed tolls of the State's HOT Lane plan? What do we get instead of answers this question? We get municipal officials meeting behind closed doors with consultants this past Monday to see presentations on why the Sate P3 HOT plan is the best option. See HOT Lanes: Municipalities Exert Influence with NCDOT on Monday? When the I77 HOT Lanes issue once again caught fire two weeks ago with the release of new information from NCDOT on potential toll rates, things got hot around North Mecklenburg among elected officials as well. As reported here last week, Davidson's Town Board declined to have a special meeting to discuss the issue. What may be even more interesting is the amount of water carrying done by the North Mecklenburg Mayors with some help thrown in by NC House Speaker/Republican US Senate Candidate, Thom Tillis. Together, Mayors John Woods, Jill Swain and Chuck Travis - along with Speaker Tillis - formed a bucket brigade to put out the flames. aShortChronicle obtained several emails outlining how the North Mecklenburg Mayors took the lead in attempting to stem the revolt brewing among the towns' Commissioners. Even with their efforts, 9 of the 16 Commissioners ultimately signed a letter to Governor McCrory and NCDOT requesting a delay in signing the Commercial Close for the project - a request that was ultimately ignored. As part of Mayor Woods's response to the special meeting request in Davidson, he indicated he would reach out to his fellow "regional mayors". 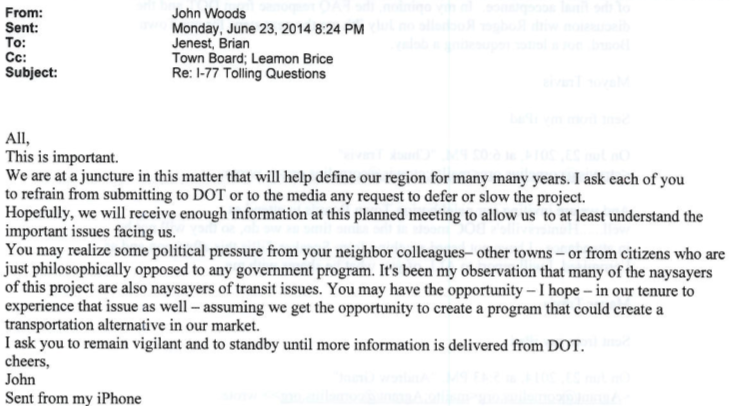 These emails appear to be the result of that effort to squelch the "hoopla" caused by the "well organized anti-group" - Mayor Woods's words to describe those opposing tolls. After a weekend of activity, Monday evening Mayor Travis from Cornelius sent the below message to the Mayors of Davidson, Huntersville, and Mooresville in response to a message from Huntersville Mayor Jill Swain. 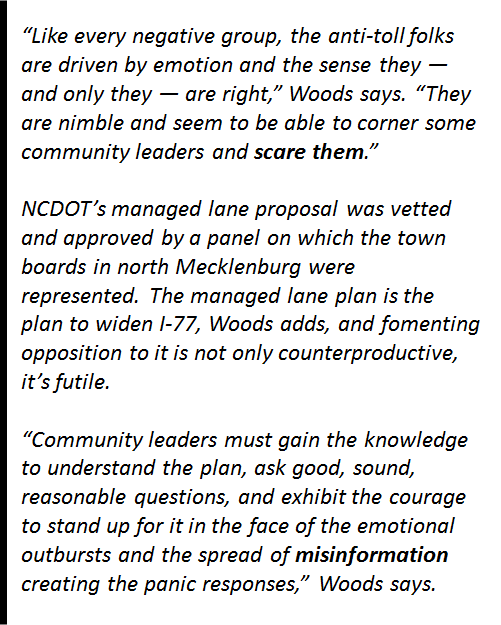 Notice how the release of more information on the I77 HOT Lanes project is described as "non-relevant" and "outdated". Mayor Swain even calls it "old news". If it's such "old news" why is it that just about every news outfit in the region and state is just now reporting on it? When the Stantec report supposedly wasn't "old news" in 2012 it certainly did not get much public attention. Maybe this "old news" was communicated to the Mayors in one of the closed door meetings with consultants like this one specifically designed to avoid public meetings law? In a separate email, Davidson town manager, Leamon Brice, laments about the NCDOT not giving them a heads up this information was coming out. Truly "old news" would not cause such concern. 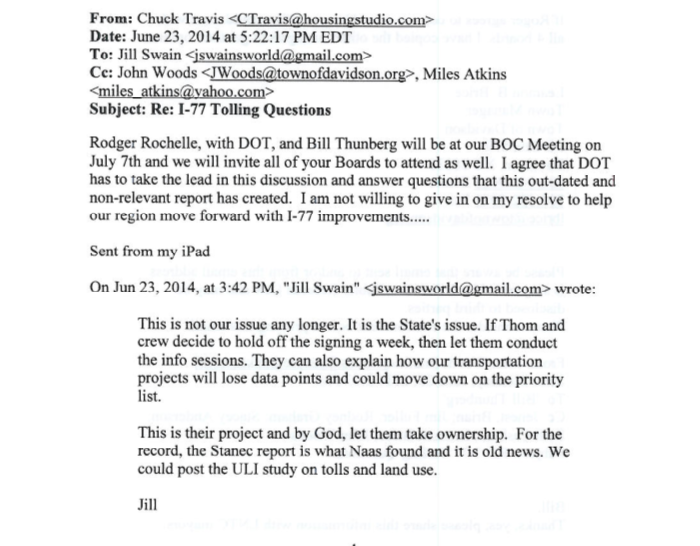 Also, notice how Mayor Swain dumps this project squarely in Speaker/US Senate Candidate Thom Tillis's lap saying "this is their project, and by God, let them take ownership." Well, apparently the Speaker did just that. See the below email just a few hours later from Cornelius Mayor Travis. This is on a separate email thread that includes the Speaker (with everyone using their elected office email accounts this time). Notice the repeated references to text messages with the Speaker, and the Speaker's apparent indication that Tarte is "Ok". That would seem to be a reference to Senator Jeff Tarte. 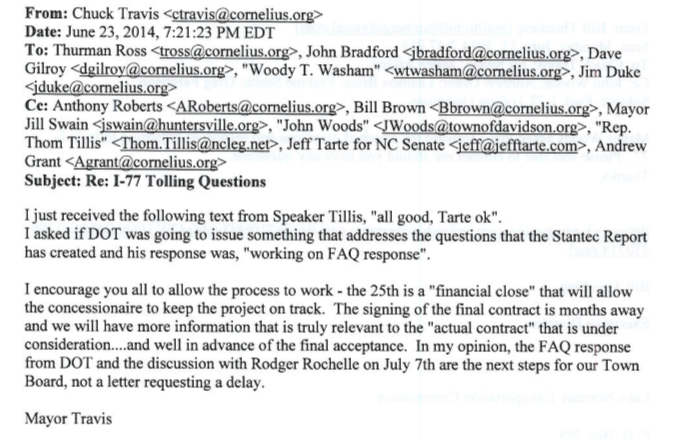 The next day Senator Tarte would tell the Charlotte Observer that a legislative review would be conducted before the final, final, we really mean it this time contract is signed with Cintra later this year. This request for review was done "with the support of legislative leaders". While we should all be glad an additional review is going to take place, the legislature has had opportunities to force a real review - aka a VOTE - on specific toll road projects. That was in the form of HB 267 last year. Read these stories to get a refresher on how the Legislature avoided going on record - H267: George Orwell Comes to Raleigh AND H267: Redux - NC House really, really, really doesn't want to vote on tolling you. With Senator Tarte and other leaders still strong supporters of the project, it's hard to see any review at this point as anything but a bit of kabuki theater. 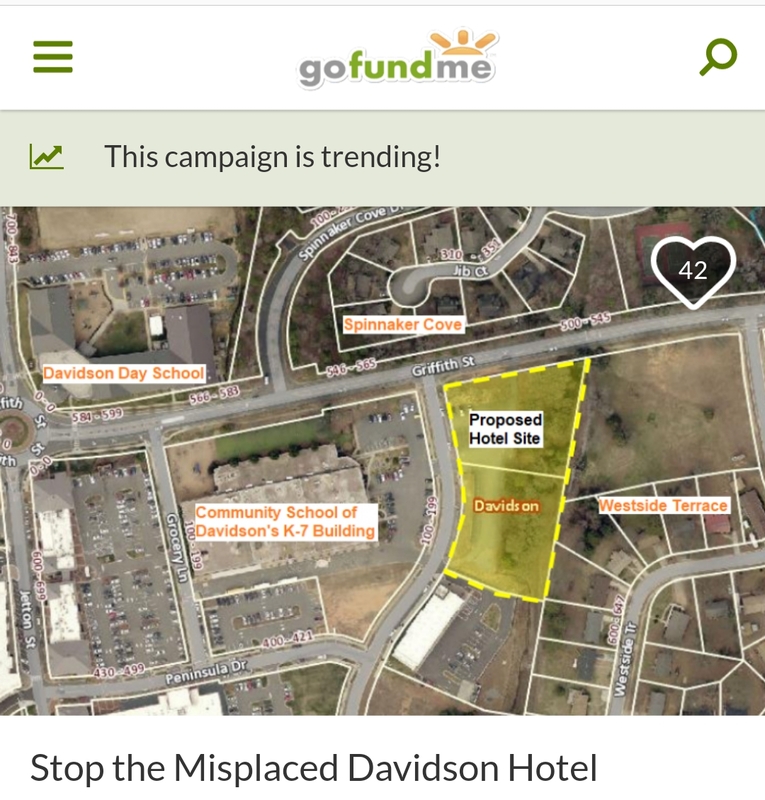 Then finally, Monday night there's this desperate plea from Mayor Woods to the Davidson Town Board. It's an obvious reference to the letter the nine area Commissioners were contemplating sending to the Governor and NCDOT. He is all but begging them not to sign it. The irony of all this effort to stop a letter from nine Commissioners to the Governor and put out a sudden wildfire? The letter had already been sent a few hours earlier. It went out late Monday afternoon. As the I77 HOT Lanes project moves forward, it's likely the "Bucket Brigade" (aka the North Mecklenburg Mayors and Speaker Tillis) will be called back into action. Bonus Observation: The passing the buck on this issue continues. In this week's issue of The Lake Norman Citizen there is an article on HOT Lanes. (link not available) According to Huntersville Rep Charles Jeter, there's nothing, just nothing the General Assembly can do at this point. Of course, Rep Jeter also voted against giving the NCGA the authority to vote on specific toll projects back during the debate on H276. Read the H267 links for the details on that. Rep Jeter repeatedly says this issue is now with the "executive branch" - meaning Governor McCrory and NCDOT. The response back from the "executive branch" to the 9 Commissioners' letter? Crickets...nothing...nada.